“Incoherent Policy”: U.S. Imposes Sanctions on Iran Even as Trump Admits Iran Following Nuclear Deal | Democracy Now! 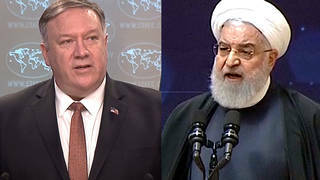 JUAN GONZÁLEZ: The State Department has announced new sanctions against Iran over allegedly supporting terrorism and the country’s ballistic missile program. The move will blacklist 18 people accused of having ties to Iran’s military, freezing any of their U.S. assets. The new U.S. sanctions came just after the Trump administration begrudgingly certified that Iran has complied with its obligations under the Obama-brokered nuclear agreement. According to the magazine Foreign Policy, Trump has instructed a group of his trusted White House staffers to make the potential case for withholding certification of Iran at the next 90-day review of the nuclear deal. AMY GOODMAN: The move was made after President Trump reportedly had a contentious meeting with Secretary of State Rex Tillerson, who recertified Iran’s compliance with the nuclear deal. As a presidential candidate, Donald Trump promised to rip up the Iran nuclear deal, calling it the worst deal ever. Well, for more, we’re joined by Ervand Abrahamian. He is a retired professor of history at Baruch College, City University of New York, author of several books, including The Coup: 1953, the CIA, and the Roots of Modern U.S.-Iranian Relations. AMY GOODMAN: Start off by responding to what just happened last week, Trump certifying the deal and then saying he’s increasing sanctions and now looking how to sanction Iran more. ERVAND ABRAHAMIAN: Well, to borrow his own word, it’s sad. Well, what it really is, an incoherent policy. The idea—of course, before, he was going to tear up the whole agreement, and he’s discovered it’s much more complicated than that. It’s an agreement between Iran and not just United States, but really the major economies of the world. And if the U.S. wants to say they pull out or even add sanctions, what Iran will do is just go ahead with its own policy of trying to improve relations with Europe. And it already has good relations with China and Russia. So, the net result, I think, will be the loss for large revenues for United States corporations, because once Iran begins to produce a lot of income from gas, it will sign contracts with the Europeans, the Chinese, Russians, and the U.S. corporations are going to be left out in the cold. JUAN GONZÁLEZ: And the significance of several members of his own administration pushing back on the president, on his campaign promises around Iran? ERVAND ABRAHAMIAN: Yes, I mean, on both sides. I mean, there was hope, I would guess, from the extreme right, that he would really tear up the whole agreement. That’s not going to work, because now he’s in there. He knows that agreement is actually a very good agreement for the United States, as well as for Iran. But then there are others who are arguing, I think, that it would be better to have good relations, or at least normal relations, because there would be an opening for U.S. businesses there. ERVAND ABRAHAMIAN: Yeah, I’m sure he sees it from Exxon’s point of view, that if Exxon isn’t in the running, there are other companies, like Total has already signed a major agreement. If not Total, a Chinese company or Shell. So it’s really a question of die-hard business interests versus some sort of incoherent ideology.